The Year in Special Operations: 2014-2015 is making its debut at the National Defense Industrial Association‘s 2014 Special Operations Forces Industry Conference in Tampa, Fla., May 20-22. You can now read what these special operators and industry leaders read by viewing the digital edition. The Year in Special Operations: 2014-2015 is making its debut at the National Defense Industrial Association‘s 2014 Special Operations Forces Industry Conference in Tampa, Fla., May 20-22. This year’s edition of The Year in Special Operations provides an in-depth look at special operations forces (SOF) today, and includes stand-alone features on SOCOM, AFSOC, MARSOC, NAVSPECWARCOM, and USASOC, as well as international SOF. 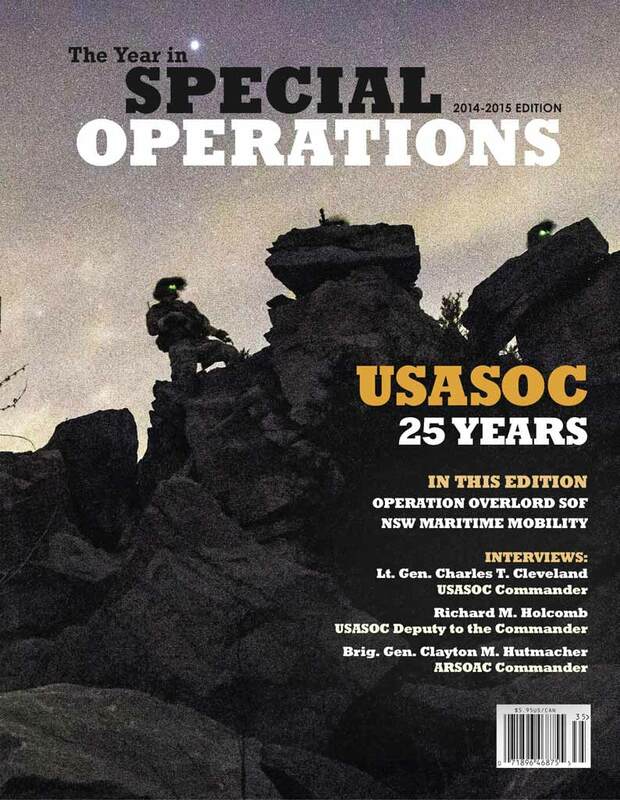 Marking their 25th anniversary, this year’s edition has a special focus on USASOC, with interviews with USASOC Commanding General Lt. Gen. Charles Cleveland, USASOC Deputy to the Commander Richard M. Holcomb, ARSOAC Commanding General Brig. Gen. Clayton Hutmacher, and other leadership within the command. SOF technology programs highlighted throughout the issue include SEAL surface and underwater mobility and SOF C4I/SWMS. And, as always we will have special dedicated stories that look at SOF history. This year’s history has a particular focus on the 70th anniversary of D-Day, with stories on the U.S. Army Rangers at Pointe du Hoc and British special forces at Pegasus Bridge.